My writing career began many years ago with the purchase of an Adler typewriter. I hated writing by hand, hated the look of my own kindergartenish writing, and so it was not until I purchased my new machine from the Regent Street Typewriter Company for the then huge sum of £50 that I started in earnest. It was on this machine I wrote, and re-wrote, many short stories and clacked out my first novel, No Angel Hotel. When home computers came onto the market in the 80s, I resisted moving to one for a few years, knowing I would miss the athletic fingerwork and the percussive noise of my reliable German machine. Now I work on a sleek, silent, state-of-the-art Apple, but I also make good use of my Ryman's lined notebook which I use when I travel or when I set exercises in class. I still hate my handwriting, but I like the look of my neat printing so I do that instead. While the students write, I write too, plugging into the creative energy that comes when a group of people are drawn together to bring something into existence that has never existed before. 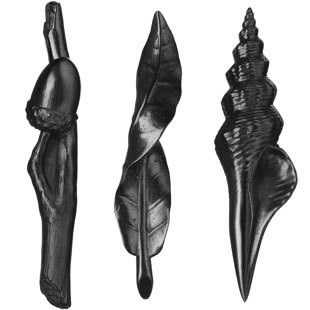 The idea for this week's blog came about when I saw this picture of what I first thought were sculptures, only to find out that they are graphite pens. I was tempted to order a set of them for their beauty alone: acorn and twig, curled leaf, spindle shell. Then I thought about it. If I did, these beautiful objects would disappear. If I used them to leave words on a page, they would vanish. Then I wondered which writers in the past might have wanted these on their desks. My research showed that Ernest Hemingway frequently wrote in pencil, beginning his writing day with the ritual sharpening of dozens of them. John Steinbeck used pencils too. When he complained that hexagonal pencils cut into his fingers after a long day's work, his editor supplied him with round ones.These gloriously anarchic pencils wouldn't have worked for him! Thomas Wolfe wrote with pencil stubs he kept in a coffee can. Truman Capote’s favourite writing tool was the Blackwing No 602, an intensely black lead pencil made by Faber Castell. Stephen King and Elmore Leonard are among those who write in longhand, though I'm not sure whether they are pen or pencil pushers. Ernest Hemingway said, “You have the sheet of blank paper, the pencil, and the obligation to invent truer than things can be true.” Stay tuned . . .